The Rohingya camps in India’s Haryana state, adjoining the capital, New Delhi, lie far from the country’s northeast from where Indian authorities deported seven Rohingya men to Myanmar earlier this month. But the first-ever deportations have caused deep worries here of more repatriations of the Muslim minority that fled persecution and violence in Myanmar. As it takes a tougher stand on illegal immigrants, Prime Minister Narendra Modi’s Hindu nationalist government has said it plans to send back the estimated 40,000 Rohingyas living in the country. They are scattered throughout India, living in dreary camps like the one lying off a dusty road in Haryana’s most underdeveloped district, Mewat. Children from the Rohingya community play outside their shacks in a camp in New Delhi, Oct. 4, 2018. At one such camp, 45 families living in cramped shelters share one water pipe, the children study in a makeshift school and the men sustain their families by working as laborers on construction sites whenever they can find work. However, nobody complains. The residents say they are willing to cope with the squalor and lack of steady work in these camps that have provided a safe shelter for the last six years from the constant fear they faced in their homeland. “Nobody harasses us in India. If we do some work, we can fend for our food. There is no problem,” said Fatima Hatu, who fled Myanmar with her husband in 2012. But the Rohingyas now worry about how long they can call this home. Ali Zohar, who is the informal head of the settlement, fears the deportation of the seven Rohingyas in India’s northeast has cleared the way for more to be sent back. Zohar, who says he was once a relatively prosperous landowner, is alarmed. The seven Rohingya men to be deported sit as Indian and Myanmar security officials exchange documents before their deportation on India-Myanmar border at Moreh in the northeastern state of Manipur, India, Oct. 4, 2018. Residents in these camps are hoping that refugee cards given by the United Nations High Commissioner for Refugees will protect them from a second displacement; about half the Rohingyas in India are registered with the U.N. The seven Rohingyas who were deported did not have U.N. cards and had been detained as illegal immigrants. That is why at an adjoining camp, Sultan Amin, keeps his U.N. card, his most prized possession, locked away. Like many of the Rohingyas living in India, he came from Bangladesh in search of better opportunities and so far the card has given him the freedom to move around and work. He says his two brothers and mother, who could not leave Myanmar, tell him that they still face harassment, and Amin believes that his life could be at risk if he is repatriated. 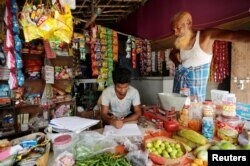 FILE - A man from the Rohingya community fills out an identification form provided by local police inside his shop at a camp in New Delhi, Oct. 4, 2018. India has said, however, that it does not recognize the U.N. refugee cards. Officials say all those who have entered the country without valid permits are illegal immigrants and state authorities have been told to start collecting the biometrics of Rohingyas so that they can be sent back. So far no member of the Rohingya community has been charged with militant links, according to security experts although they say there are apprehensions that they could be targets for radicalization. Political observers say Prime Minister Modi’s Hindu nationalist government’s plan to deport the Rohingya Muslims represents a U-turn on India’s traditionally tolerant policy towards refugees. For example, India is home to tens of thousands of Tibetan refugees. An independent political analyst in New Delhi, Neerja Chowdhury, links the tougher posture to general elections scheduled in 2019. There have been loud calls from Hindu groups linked to the Bharatiya Janata Party to send back the Rohingyas. “Certainly if the discourse can be polarized on Hindu-Muslim lines, it is advantage BJP,” Chowdhury said. The refugees say all they want is a patch of land where they can have shelter and where they can eke out a living. “All my relatives and family there (in Myanmar) have been killed. When our country is safe like India and Bangladesh, we will go back,” said 30-year-old Noor Begum at a camp in Mewat. Such voices are supported by the United Nations refugee agency, which has criticized the deportation of the Rohingyas and said refugees should not be sent back to countries where they fear persecution.